Laugabjarg is centrally located in Reykjavik, a 3-minute walk from Laugardalslaug Geothermal Pool and 5 minutes by foot from Laugardalsvollur. 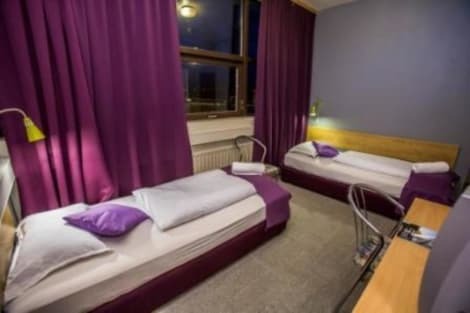 This historic hostel is 0.6 mi (1 km) from Laugardalsholl and 1 mi (1.6 km) from Reykjavik Park and Zoo. Found in Reykjavik East, the modern Brim Hotel is just a few minutes’ walk from Laugavegur – the city’s main street, and less than a mile from the Hallgrimskirkja church. The hotel has a 24-hour front desk, which provides tour and activity booking services, and free parking is available. The hotel’s rooms offer wi-fi access, linens, toiletries, desks and towels – while a choice of both shared facilities and private bathrooms are available. Heida's Home is located in central Reykjavik, just 1 minutes’ walk from Laugavegur shopping street. All the brightly decorated rooms and apartments have free WiFi access. Apartments at Heida's Home have a kitchenette and a private bathroom with shower. Guest rooms have access to shared facilities. Bed linen and towels are included. Hlemmur Bus Station is a 2-minute walk away. Harpa Concert Hall & Conference Centre is 1.3 km from the guest house. With a stay at Atlantic Apartments and Rooms in Reykjavik (Reykjavík East), you'll be within a 5-minute drive of Kringlan Shopping Mall and Grasagardur Botanical Garden. This hotel is 1.4 mi (2.3 km) from Laugardalslaug Geothermal Pool and 1.8 mi (2.8 km) from Laugavegur. Take in the views from a terrace and a garden and make use of amenities such as complimentary wireless Internet access. This hostel also features concierge services, a picnic area, and barbecue grills. 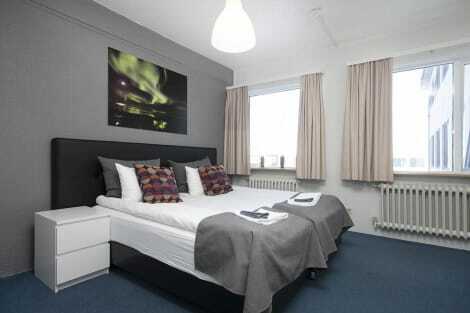 A short walk from Kringlan Shopping Centre and the geothermal seawater at Nauthólsvík Beach is the 2-star Capital-Inn. The hotel has free onsite parking, free wifi, a bicycle rental service, fully-equipped shared kitchen, and a lounge area with flat-screen TVs, DVD player and surround sound system. Modern rooms offer either shared or private bathrooms and some have TVs.